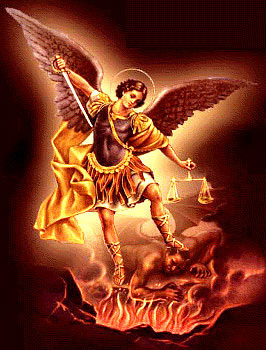 St. Michael is one of the principal angels; his name was the war-cry of the good angels in the battle fought in heaven against the enemy and his followers. It would have been natural to St. Michael, the champion of the Jewish people, to be the champion also of Christians, giving victory in war to his clients. He is regarded as the patron and protector of the Christian Church, because he remained faithful to God, and defeated Lucifer. He is the Patron Saint of Paratroopers, Police officers, Mariners, Grocers, the sick and Paramedics. He appears in Holy Scripture as the guardian of the children of Israel. Saint Michael the Archangel is represented in Christian Art as a beautiful young man, winged, clad in armour, and with sword and shield combating the dragon.